Back in the day, Dee was a comic book artist. One of my web-comics ran for 5 years of page-a-week updates, at the end of which I had one 127 page book, ha. Now I only write words and, output-wise, let me tell you omg is it more efficient. But I still get the urge to draw. So occasionally I shake the geckos out of the Cintiq and make stuff. This is the "CD cover" for Richard's song, Special Boy. HARRY KIM, YOU'RE THE WORST. You can listen to all of Richard's original songs for the podcast here. Post Atomic Horror Podcast homepage is here. 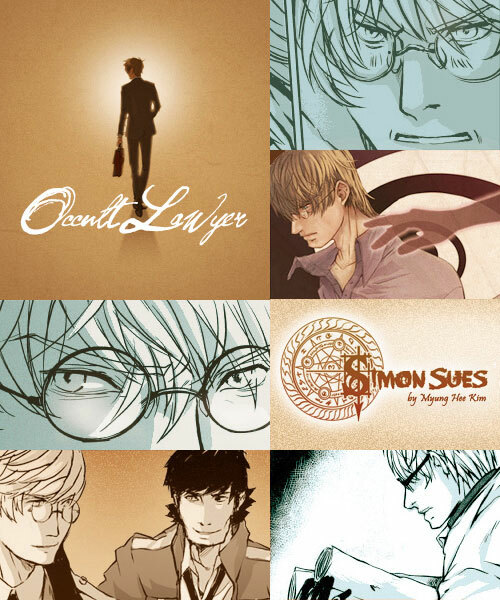 My friend Myung does a supernatural thriller comic called Simon Sues. She's up to episodes in the 80s and these are not tiny little chapters either, my friend, oh no, they're like 30 drawn pages long and chock-through with just really killer fight scenes. So when I got really into picspam on Tumblr I naturally did a few for her characters, Simon and Issac. If a mashup of Law and Order and Faust and supernatural horror and action/adventure and fantastic art sounds good to you, check out Simon Sues on Tapastic.